This ball of fur must have gone from watching soccer games to wanting to be part of the action—though no athleticism is involved. 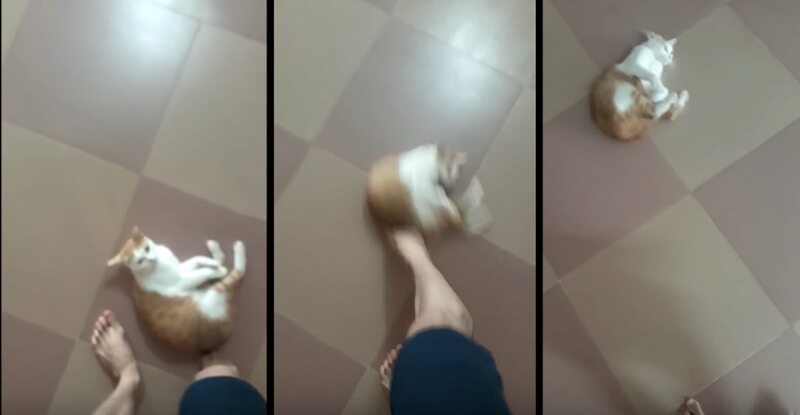 A man from Hanoi, Vietnam recently uploaded a video of his cat who simply delights in being pushed across a smooth floor by his human’s foot. The kitty can be seen scurrying over to his owner, lying down on the floor, and eagerly awaiting the man to gently shove the cat across the ground – kind of like a mini power slide. The father-feline playtime is probably cleaning the floor too—and judging by how the cat keeps coming back for more, it must be even more fun than it looks. That is amazing. It’s clear this cat is asking to play the soccer game. I had no idea cats would play games like this without the involvement of a lot of treats.